Age: It went live on August 17th 2001, making it over 16 years, 7 months old. Network Solutions Llc (Virginia, Herndon) is the location of the Sun-ONE-Web-Server/6 server. 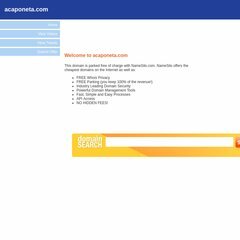 Acaponeta.com's IP address is 205.178.189.131. There are 2 Nameservers, ns55.worldnic.com, and ns56.worldnic.com.